I was in Trader Joe’s the other day and they were handing out samples of their premade mashed potatoes mixed with kale. Of course I tried it – and it was SO good. A really amazing combination. I marched myself right back to the produce department and grabbed some potatoes and kale – I knew I could recreate this dish at home. And make it better. The dish evolved a healthed up bangers and mash. (If you don’t know what that is, it’s and English dish of mashed potatoes, sausage and onion gravy. To die for.) I wanted the potatoes to have a bite to them – so I added green onions. And I amped up the creaminess without adding extra fat with some low fat cream cheese. Oh, and I added in some cheddar. Cause cheese makes everything better. The end result? YUM! The perfect plate of comfort food to tuck into in front of a roaring fire. 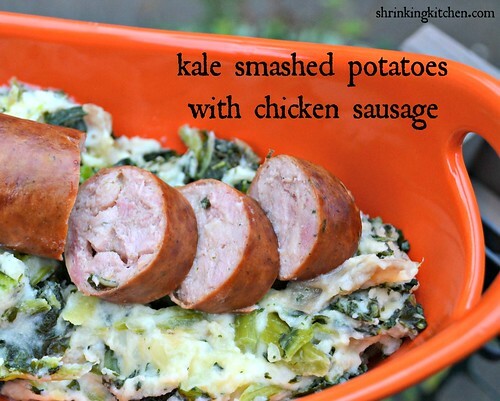 My kids devoured it – even the kale. An added bonus is that you can easily get this on the table in less than 30 minutes. You can use any kind of chicken sausage you like – I used garlic and herb chicken sausages from Trader Joe’s. You can even find frozen kale in some supermarkets – talk about a time saver! Place the sausage on a foil lined pan and bake for about 15 minutess, turning once. While the sausages are in the oven, boil the potatoes, in their skins, until very tender. Meanwhile, steam the kale for about 4 minutes. Drain the kale and squeeze out as much excess water as possible. Drain the potatoes and place them back in their cooking pot, over low heat. Add the cream cheese, milk, cheddar cheese and green onions to the potatoes and smash to desired consistency. I like them kind of lump. Fold the drained kale into the smashed potatoes. Divide the potato mixture among four dished and top with chicken sausage. Mmm, I ate this growing up. It’s called Boerenkool and is a popular dutch recipie. YUM! This sounds amazing, Heather! I always love the great combinations you come up with. Can you believe that I have never had kale?! This recipe is easy enough to give it a whirl and sounds delish! This dish is out of this world! I was so impressed with how easy it was. My husband has Celiac, so we have to have everything GF and this is a receipe he requested to put on the make often list. I love you menu plans, they are simple and non-time consuming. I would sub plain greek yogurt or sour cream. How big are the sausages? We have a hard time finding chicken sausage around here but easily find (and love) Turkey sausage, but it comes in a 13 oz. package.